YESsssssssssssss. I just got mine as well. Freak'n Sweeeeeeeeeeeeeeeettttt. Thanks! Picked up one for me and one to send to my brother! Purchased a couple last night. Thanks for the heads up! Just checked the mailbox and look what arrived today! 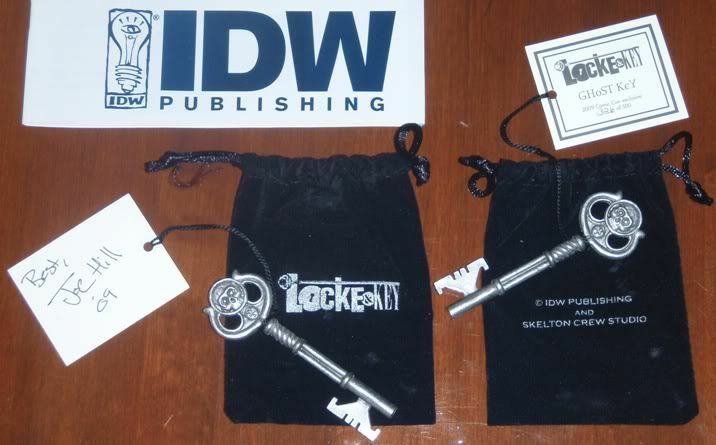 This is the special edition LOCKE & KEY promotional key that was produced especially for the San Diego Comic Convention. Each one is numbered and each one is signed on a special accompanying card by Joe Hill. The limitation is 500. Each one comes in a special L&K promotional pouch (printing on both sides). Got mine today, #323 of 500!! LOVE it! Thanks to IDW and Joe. Dang...I had a couple get picked up for me at SDCC, but they weren't signed...oh well...but i really like the key! Thanks I had hoped to find one of these and thanks to you guys its not costing me the earth as is from IDW directly. Can't believe I missed out on a signed key. I feel your pain, dyetye! 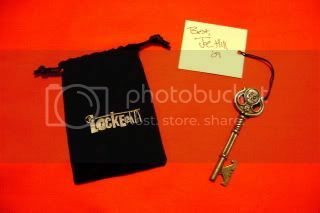 Betsy_Boo wrote: Can't believe I missed out on a signed key. I feel your pain, dyetye! Thanks David...Yeah. I realize that there are some available but due to financial reasons I can't justify the expense right now. I paid $35 for an unsigned key and if I purchase another one I think the guilt would be too much. I know...that probably makes no sense to anyone but me, but there it is. I wish I had known IDW was going to offer up the leftovers, but I had to grab one when I had the chance. Please PM me your address. There's a special place in heaven for a man as kind and thoughtful as you are. I got my key and I can't possibly thank you enough! This is honestly one of the nicest things anyone has ever done for me! Definitely on a par with Joe awarding me a signed 20thCG! You are the best! I will treasure this not only for Joe's signature, but also as a reminder that there are still some really good & generous people in the world. I sincerely hope that someday I can do something equally as nice for you! All you have to do is ask!